Fresh herbs are a simple and healthy way to add a bright, earthy flavor to any recipe. Start by making the Tarragon Aioli since that will need to chill for at least 30 minutes or up to 30 days (directions below). Place grill plates on the Evolve grill. Use the switch at the bottom right rear of the grill to lift the back, so drippings run into the drip tray; place drip tray under the front of the grill. Close cover and set cooking temperature at 425°F and cooking time for 7 minutes. Allow grill to preheat. Gently mix turkey with egg, breadcrumbs, rosemary, thyme, mustard, salt and pepper. Form into 12 slider patties. Grill for 7 minutes or until cooked through. Transfer to a plate and cover with foil; set aside. For the sweet potatoes, use a fork to pierce the sweet potato several times. Cook, in microwave, for 3 minutes or until almost cooked though, remove from microwave. Slice into 1/2-inch rounds. Toss potato with oil, smoked paprika, salt and pepper. Grill for 5 minutes or until tender. Spread Tarragon Aioli evenly on tops and bottoms of slider buns. 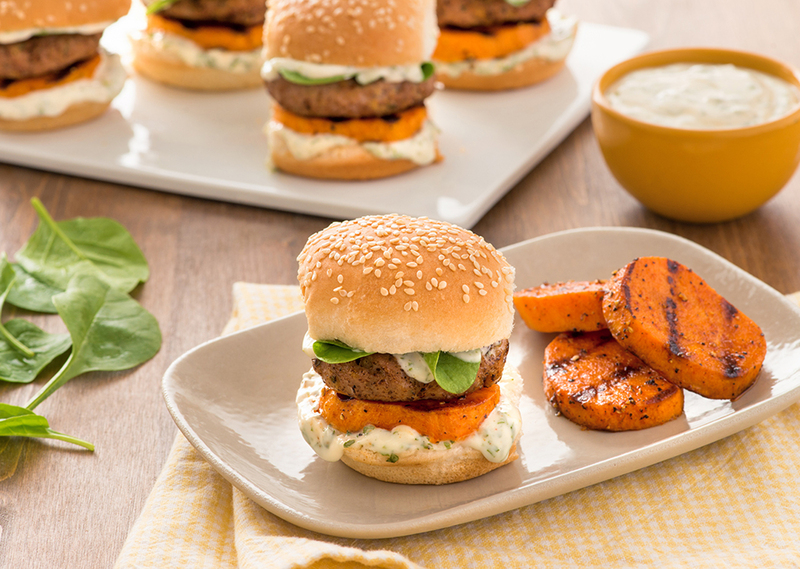 Place a sweet potato round on each slider bun. Top with a slider and spinach. Serve extra sweet potato rounds on the side. Stir mayonnaise with tarragon, vinegar and sugar. Cover and chill for at least 30 minutes or up to 30 days.